Widely considered by most to be the worst Rolling Stones album, by far. It had a lot going against it - a fractured band with its main protagonists pretty much functioning independently of each other, even mild-tempered Charlie Watts falling out with Jagger, a musical trend at the time of synthesisers dominating everything and, yes, a bloody awful cover. Let me try and "accentuate the positives" with this review. It is had too much negativity over the years, probably correctly, but oh well, here goes. "One Hit To The Body" is a rousing, impressive opener employing that old acoustic/electric guitar riff intro again and some impressive guests like Led Zeppelin's Jimmy Page, Bobby Womack, Patti Scialfa and Kirsty McColl. It is as good as anything on "Emotional Rescue" or "Undercover" to be fair. "Fight" is a bit more of a Stones-by-numbers track with Ronnie Wood on bass (unusually), it is lyrically bland but has a killer riff opening and "Harlem Shuffle" is a totally convincing cover of Bob & Earl's 60s soul hit. Excellent vocal and general sound on this. Nothing wrong with it at all. "Hold Back" is a pounding drum attack rock number and is redeemed by another energetic Jagger vocal, as indeed is "Winning Ugly", whose synthesiser riff is also rescued by a funky bass and drum underpin taken, in my view, from Don Covay's Northern Soul number, "It's Better To Have (And Don't Need)". Strangely, Covay appears on this album on backing vocals on "One Hit" and "Sleep Tonight". Maybe he had some input? Jagger also attacks this enthusiastically, going falsetto in places again. Keith Richard's obligatory reggae number. "Too Rude", is enjoyable too. I always like these. Jimmy Cliff appears on backing vocals. "Back To Zero" has a delicious funky intro and, yet again a good Jagger vocal. The guitar and drums are great on this and, yes, it is a good track. Hints of dub reggae in its skanking guitars in places too. This would have sounded great on "Undercover", with its political undertones about the world's impending meltdown. Ronnie Wood's bass on this, again, is impressive. You know, Im enjoying this re-listen quite a lot... This is possibly the best track on the album. 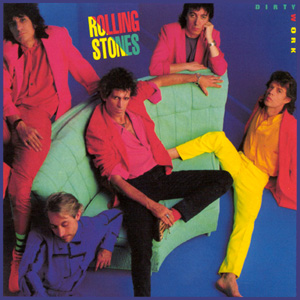 The title track is pretty much a typical mid 80s Stones cut. It is ok, but that's about it. If you like The Stones you can listen to it and there are good parts, the chorus is catchy. A lot of people have moaned about the 80s drum sound on tracks like this, and, although it is a loud attack, at least they are proper drums and not a drum machine. 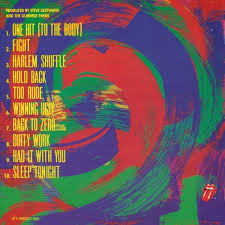 "Had It With You" features Ronnie Wood on saxophone, would you believe, but a lazy vocal and general unremarkableness pervades. A blues-inflluenced "bridge" sounds pretty terrible, to be brutally honest. Probably the album's low point. Richards' affecting low-key ballad "Sleep Tonight" finishes things. Good old Ronnie is now, unbelievably on drums, not very impressively and Keith's vocal is unsurprisingly laconic. Yes, it probably is their worst album, but, as a Stones fan, I will try to derive something from it and the occasional forty minutes listening to it every few years is enjoyable enough.